Listening to the Complete Broadcast of the D-Day radio broadcasts of June 6, 1944 brought a flood of memories to me, but I have never heard them before. That may sound strange. I was right in the middle of the D-Day Invasion -- witness to one of the most important military events of our age yet had limited information. We only knew what we could see and hear and feel in our immediate surroundings. We received briefings from senior military but only what we needed to know. On that day I was a 21 year old Indiana farm kid who had been drafted into the Army. I found myself on an LST in the English Channel heading for Omaha Beach, Easy Red, at Normandy, France. I was assigned to the 3466th Ordinance Company, MAM (Medium Automotive Maintenance), 5th ESB (Engineers Special Brigade), Third Army. 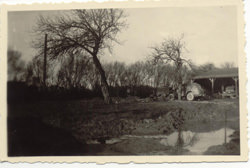 After completing basic training at Fort Riley, Kansas and further training at Camp Claiborne, Louisiana to become a mechanic, we were told we were heading to North Africa to help in the quest for Rommell. We never got there because he was stopped. We were re-routed to Fort Sam Houston, Texas then to Camp Kilmer in New Jersey. From there we went by British ship from New York to England leaving December 26, 1943. A portion of Omaha Beach with sign indicating a mine field. We arrived in Liverpool and quickly traveled to Wales, moving constantly from one area to another to hopefully confuse the Germans. It was there that I was introduced to the "ducks" (officially known as a D.U.K.W. which is a 2 ½ ton amphibious vehicle). We learned how to service and maintain them for our troops. Just before D-Day we left Wales on an LST with a great number of "ducks" below deck, six of them being taken by the 3466th men for replacements, many other Army troops on the top deck, and my buddy Tony and I on the top with our two and a half ton truck fitted with a 50 caliber machine gun and loaded with dynamite, ammunition, gasoline, and hand grenades. The weather was rough as we left the docks and formed up a convoy in the channel with the countless other ships assembling for the invasion. Finally we were underway in poor weather. It was a short crossing. At some point while we in route the radio broadcasts must have begun. Back home friends and family were receiving the initial radio news of an impending invasion; we did not get that news. We were scared. At H-Hour, Tony and I were on that LST just off the shore of Omaha Beach. Smaller craft were to come and off load all of us since the LST could not get closer to shore. We waited and waited as the invasion began. We desperately needed to get to the beach for our men. We had supplies and ordinance. No one came. We stayed in place and waited. The USS Texas and other ships passed close by repeatedly and shelled the coastline. On through the night the fighting raged. We were helpless to aid our comrades. We could not get off the ship. I do not know whether that was the plan or for some reason the landing crafts could not reach the LST. 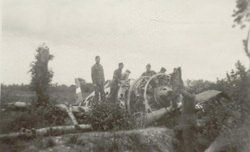 Examining one of the blown up boats on Omaha Beach.. 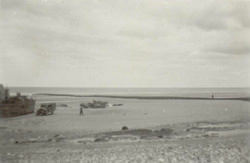 The infantry troops out in the channel were ordered to land on the beach early and to make a push off the beach inland. All vehicles bore color coded squares which indicated their landing wave. The plan did not proceed as anticipated since the troops were pinned down on the beach and could not advance. We had been told that the front lines would be about ten to twelve miles inland but the fighting was still on the beach on D-Day. Into the next day, June 7, the fighting wore on as we watched and waited. Early that day, a break was made with the help of fresh troops on the beach to advance farther inland. Finally, the huge doors on the LST opened and the "ducks" crawled into the water and headed toward the beach. Two of our Company's six "ducks" hit underwater mines and were destroyed. The troops were off loaded into landing craft under rough seas with no men lost in the operation. A "Rhino ferry" or pontoon barge was to come and get the truck, Tony and me. It did not come. We waited and watched for hours, anxious to help our fellow troops. Still no ferry. We were scared. Finally, in the early evening about dark, the Rhino ferry arrived; we loaded the truck and went to shore to join the fight. The LSTs were then to take the wounded back to England after unloading all the vehicles and troops. By the time we landed, the front line had advanced a short distance inland. We had to find our unit. After a couple of hours of searching we did join up. We were afraid for their safety and, as we found out, they were concerned and were searching for us. They thought we had been lost in the invasion. Our friends and family back home were hearing the progress of the invasion on the radio but we still only had information from our direct experience; we did not know the big picture. We were disoriented, confused, and scared but very glad to be alive. I talked to several war correspondents on the beach to get information. They did provide limited news.
" Mud - mud- mud everywhere." We set up a small vehicle repair facility that operated eventually on a 24 hour, every day basis with two shifts. We remained in the area to about November 1944. 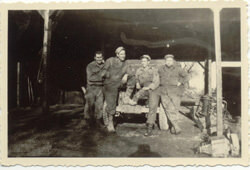 From there I went to the Bulge area in Belgium and worked to keep vehicles moving on the Red Ball and ABC Highways. Those were the main supply routes for our troops. I returned home from Antwerp, Belgium to Camp Myles Standish near Boston. 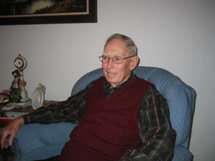 I finally arrived back in Indiana at Camp Atterberry and was discharged on Christmas Day, 1945. What a Christmas present! I am no hero and seek no recognition. Those boys who stared death in the face on the beach and front lines are heroes. Those men who lost their lives are heroes. They gave it their all. They made the supreme sacrifice. I did my job and did it well and am proud to have served. I was lucky; I got to come home. I have had a wonderful life and am still in good health. The Lord has blessed my wife and me and we are very grateful. My unit has had several reunions over the years but there are a precious few of us left now. Most are too frail to travel much - those once tough men who helped defeat the German regime are growing old and passing on. We may not be able to have another reunion but I'll see them all again in another place - a place more wonderful and peaceful than we can imagine. We will again be strong and hearty. Yes, these recordings mean much to me, so much so that I cannot listen to them for any great length of time because the memories come flooding back. Things that I thought I had forgotten. Events that I need to string together. I need time to digest it all before proceeding. To some, these recordings are but an interesting piece of history. To me, they are a piece of my personal fabric. The D-Day Invasion has left its mark on me that I cannot erase. Not a day goes by that I wonder why I could not have joined the rest of my unit when they went ashore instead being on that damned LST! I'll never, never know why it happened as it did. But wait……maybe it is so I can tell my story to others over these many years so they can know the tremendous sacrifice others made for our Freedom! These recordings help make that possible. 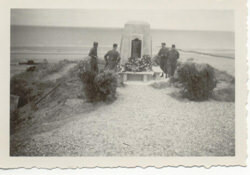 Be the first to comment on "Old Time Radio Memory: Lee: Remembering D-Day, June 6th, 1944"